Greetings from 60 days later. Insert expletive in-between the six and the zero and you'll be spot on with what my brain is thinking. I vacillate between wow this is incredible and why the hell did it take so long? I recently read it's hard to bring about lasting personal change without the feeling of despair. At the end of January, I truly felt the depths of despair, unsure of my ability to even believe I was capable of bringing about the sweeping change my life so desperately needed. I just started one day at a time. Profound concept, huh? Before I knew it, I found myself in week two. 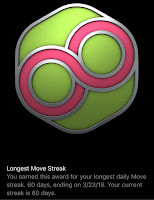 Then I was earning the perfect month badge. Now i'm sixty days out from my defining moment. There are so many parts of my story that are still unspoken, but it feels good to start with celebration.